After the tragic loss of his wife Amanda in an airshow accident, Kyle Franklin will return to the circuit with a dramatic new airplane. 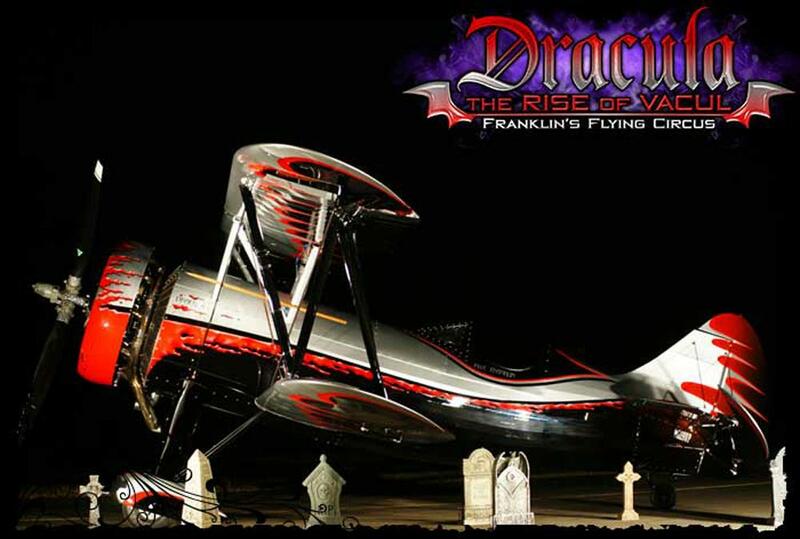 Revealed this week at the International Council of Air Shows (ICAS) convention in Las Vegas, “Dracula” is a highly customized biplane with the retro appeal of early Waco racers – speed cowl, sloped windshield and sleek fuselage lines. Its full-span ailerons yield a 300-degree-per-second roll rate. The MT propeller contributes 100 pounds to overall weight savings. A two-color smoke system and dramatic airbrushed paint scheme lend to the horror-movie theme of the performance. The airplane is designed to be towed overland, enabling a more stable schedule of appearances. “Dracula” was originally conceived by Franklin’s late father Jimmy Franklin, and also features what Kyle calls the “Amanda Switch.” Named for his late wife who died from burns following their accident, the switch cuts off the fuel and smoke oil supply after a severe impact. To see the bipe’s stunning introduction video, click here.